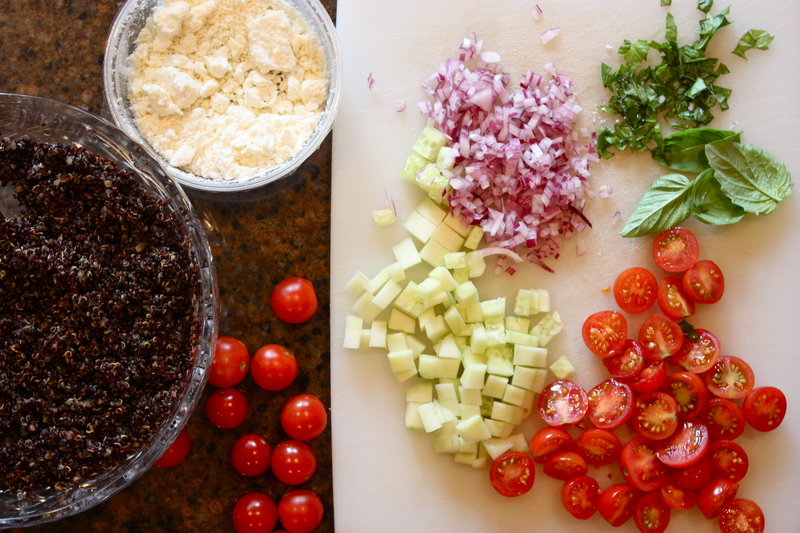 Black Quinoa Salad, Mediterranean-style | "Il faut goûter"
The edible seeds seem to have emerged as a faddish health food lately, and not without import. It’s gluten-free, easy to digest, full of protein, and a good source of fiber. So of course I want to eat healthy things, but mainly I picked up the last bag of black quinoa on the shelf at my local health food store (Good Shepherd) because it looks neat and I’d never cooked with it before. (I picked up a bottle of Orange Blossom Water on the same trip–recipes coming soon!) Quinoa is a great (and really, more flavorful) substitute for rice, and it’s also nice for traditional pasta salad recipes. The texture is pleasant–light and chewy with a slight nutty crunch–and it’s delicious hot or cold. 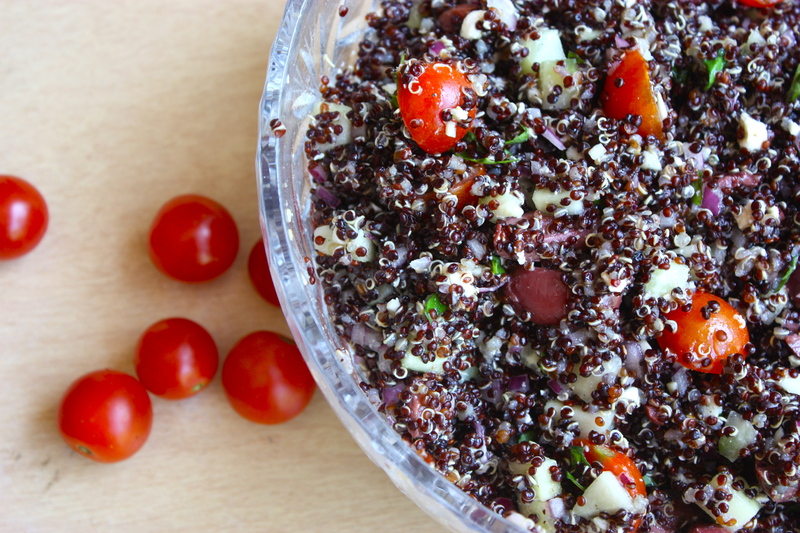 Buy a bag of quinoa, say “quinoa” five times fast, and make this salad (or your own version of it)! Bring vegetable broth to a boil. Pour in quinoa. Cover and reduce heat to medium-low. Simmer for 20-25 minutes or until all the water is absorbed and the quinoa is tender. (In my experience, the quinoa isn’t finicky and doesn’t get gummy—after 20 minutes, there was a bit of broth left, so I kept cooking it until the liquid was absorbed). Pour cooked quinoa into a bowl and allow to cool to room temperature. Stir in vegetables, cheese, and basil (and whatever else tickles your palate). Pour vinaigrette over and stir salad. Taste and tweak. Serve cold or room temp. Looks delicious! I am already a quinoa fan so I will be trying this recipe soon. Thank you! I am excited to make this in new mexico… I might add green chillies from the backyard. talk to you soon! Mase this for friends during the summer and the loved it. I gave one the hard copy of the recipe. I thought I had pinned it or at least bookmarked it. I couldnt find it but I found it again tonight and I am so happy. It is now safely printed and will only give copies of it to anyone who asks. Thanks for sharing. 😀 I’m glad you’re enjoying it!